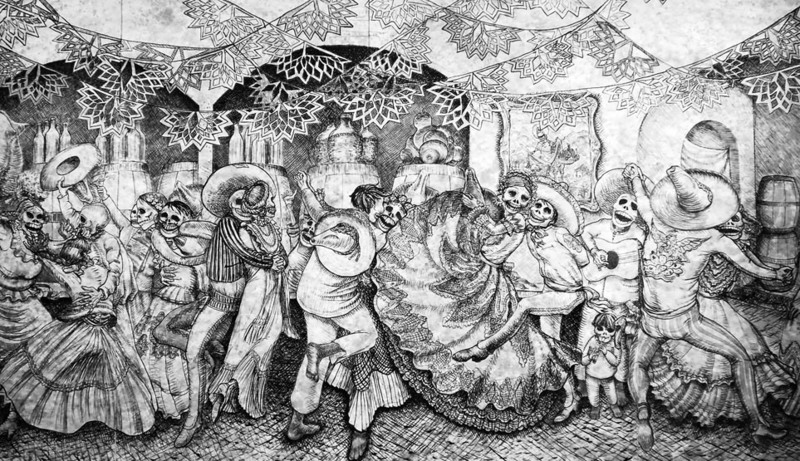 Día de los Muertos is born out of Mexico's colonial Catholicism and indigenous traditions that honor the dead. The days begin on the first of November — All Saints Day and the second of November —All Souls Day. 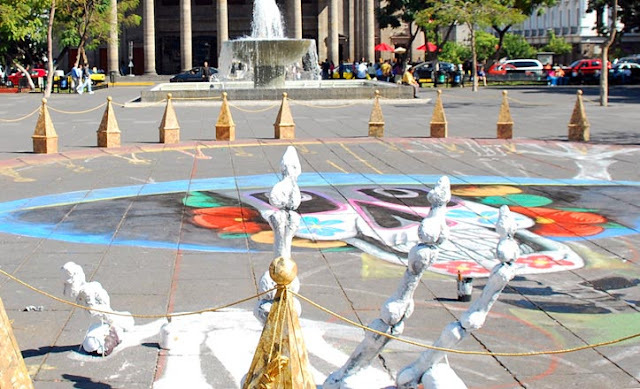 The first day of remembrance is dedicated for the children — Día de los Inocentes — who were taken before their time. Godparents will set a table with pan de muerto (the bread of the dead) and candied skulls. The Día de los Inocentes is more solemn than the día for the others and through this outpouring of love and remembrance allows mourning parents the comfort of community. The second day honors the elders and adults who have passed on to the other side and families gather in cemeteries bringing offerings of the departed ones favorite food or drink and candied skulls. Marigolds — Flor de Muerto — are placed alongside the headstones as they are believed to attract the souls of the dead. Reverential yet lighthearted, humorous tales and anecdotes are shared of the deceased as they are brought back to life through words and poems. These poems — calaveras — began life as fake obituaries to the rich and pompous. 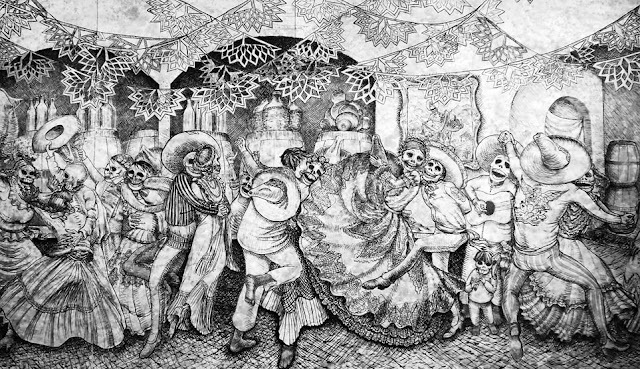 From these calaveras came the iconic pictures that are now known as the Catrina. The image of the well dressed skeleton of a woman. Mocking in nature the images, now both men and women, were popularized by Jose Guadalupe Posada and initially intended to convey that under all the finery, under the audacity and pomp of the living, regardless of financial position, we are all the same under the skin. North of the Mexican border Día de los Muertos is an opportunity for emigres to celebrate their heritage through parades and community events. In many northern communities, Día de los Muertos affords an extension of Halloween activities with a nod to heritage and the dead. Learn something new everyday, great informative post.